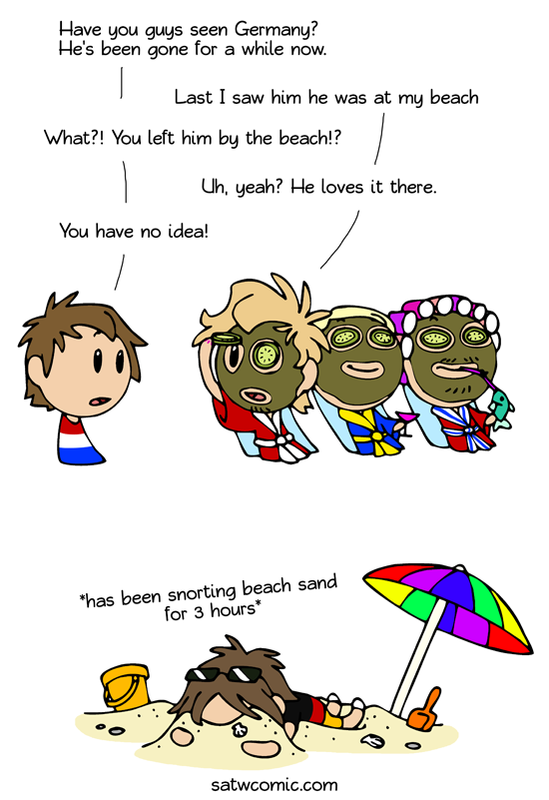 Germans are crazy about the beach. If you leave them there, there is no guarantee they'll be the same person when you find them again. I just went through the same experience. From the state I live in, the closest beach is 10 hours away. And because I don't have a super rich family, so our vacations are never to the beach, but to the mountains (which is not much of a vacation because I can see the mountains from my house, we live less than 45 from them). So recently, my church went on a two day trip to Florida (which is 14 hours away). When we pulled into the beach, I screamed at the top of my lungs, almost causing the driver to wreck. I was screaming while still in the car, "DEAR GOD THERE IS AN OCEAN THERE! Let me out! Let me out! Let me out! LOOK THERE IS A FREAKING PALM TREE! DO YOU SEE THE PALM TREE! THERE IS REAL SAND! LOOK IT'S WHITE! HOW IS SAND WHITE?" Then the car made contact with sand and I jumped out of it while it was still moving. They told me not to go to the water, so I rolled in the sand and rubbed it all over my body. Then when they told me I could go in the water, I sprinted full speed toward the ocean while screaming. Then I let the tide pull me about 100 feet out (just about at where the limit is for swimmers, and every body was getting worried about me, and I was trying to tell them let me die in peace. I was in the water for four hours, and it got to the point that I had been in the water so long that I no longer had the strength to swim back, and I was dehydrated after swallowing mouths full of ocean water and not drinking anything, and I was horrible sunburnt from not putting sun screen on. So I was prepared to die in the ocean, and I was letting water come over my face. Then my friend swam all the way out there to get me, and pulled me back to shore, telling me it was time to leave. The adults with the first aid kit made me drink a lot of water and eat a lot of food. That was over a week ago, and my sun burn is still peeling. I HAVE NO REGRETS. Ok, that's pretty extreme, I can't say I'd ever go that far. But I do get that the further away from the ocean, the more special it is. I have been to a beach on the ocean more times in the past year than I did in the year I lived minutes from the beach, or probably any the years I lived about an hour from the beach. No, I don't mind answering. I live in Eastern Tennessee. I live in the Valley, so we are surrounded by woods and mountains. The town I live in is a BIG science town and has a national lab in it, so our town is different from any other southern town. All the other towns are very homogenous in religion and race, while our town is very diverse in every way. People from all over the world come to work at the lab, so there are a lot of Korean, Polish, German, Indian, and even some Israeli and Arabic people here. You can go from city to complete mountains in under 10 minutes, and the Smokey Mountains are visible at the tops of some of the ridges. We also have A LOT of lakes and rivers. So our town is also A ROWING MECCA, and people from all over North America (especially Canadians because they love the weather) come to row in our calm waters. We also are big on the environment in Tennessee. Our fine for littering is $500, $5000 dollars per tree cut down, every house has a recycling bin that has a special pick up time and an reward system per pound, and the schools all have community gardens. Surrounding cities use a lot of hydroelectric energy from the dam run by TVA, some energy is provided to mountain communities by windmills, and many business, labs, and street lights are solar powered. Some coal is still used, but soon it will disappear. Coal mining was the big thing in all the towns around us, but now it is almost irrelevant and they are all out of work. Those towns are overrun with drugs and are very government dependent. Besides our town, all the surrounding towns are farming towns or old coal mining towns. But then there is also another really big city near us is known for there civil war history, football, and southern charm. Our school system is one of the nation's finest. We have a big STEM focus (we have the nation's 6th best robotics team), but I am a social studies person, so I take college level government and economics classes and am part of city boards and participate in Mock U.N. debate sessions on a regular basis. We also have a great orchestra program that I am a part of as well. I play violin, but dabble in bluegrass and Irish fiddle music (In fact my friend and I go to play in sessions at an Irish pub in the next city over). However, the small towns around us have poor education, which earn the south all our sterotypes like being stupid (which all of their issues are caused by poverty and lack of resources), so in short, we are not all illiterate, wife-beating, rapists (some of us are, I am just saying) like most people seem to think. When I go some where like D.C., I get treated like an idiot. Our town is very strange because we where built specifically for separating Uranium for the Atomic Bombs during WWII. So it was built in the middle of no where to be kept a secret. Now we are very devolved, but the middle of no where-ness still remains so we are basically a city in the woods. My house is on a street and in the woods at the same time, to the point I have woken up with possums and raccoons in my house. You can literally sit at Starbucks and watch the sun set over the mountains here. About the Florida thing, YES, it does takes that long to drive to the beach. I don't know how, but it takes 4 hours to get to Georgia, and after that it seems to take FOREVER. We left a 12:30pm to go to Florida, got in the state around 1:00am, and got to our destination around 3:00am, and were on schedule. You can drive east to north or south Carolina, but that takes around 8-10 hours because of the mountains and frequent rock slides. That's kinda true. When we, as a family, discuss the holiday destination, it's always the same: "I found a nice house, it's clean, cheap, the reviews are good, dogs are allowed to stay there and you have a wonderful view! It's perfect!" - "Nice, is the beach within walking distance?" - "No..." - "Meh. Let's continue searching." Even when we're traveling to colder areas; even if it's not a sand beach, we want to see a beach. 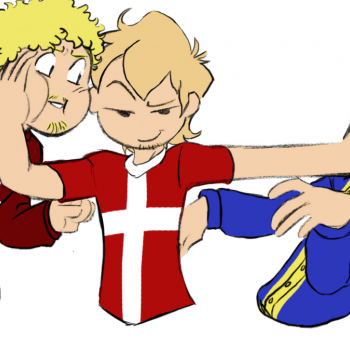 Norway is drinking a fish? 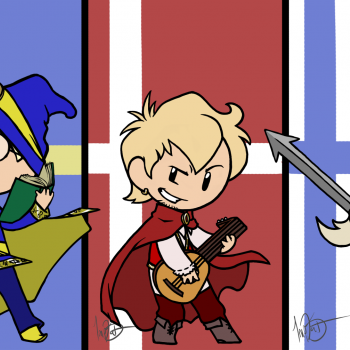 But look at Norway with his fish!